Typically, a motherboard or PC system with up to two discrete independent displays is common but with the increase demand of more display panels to be supported simultaneously, VIA Technologies sees the need to come out with next generation platform targeted for those usage models. 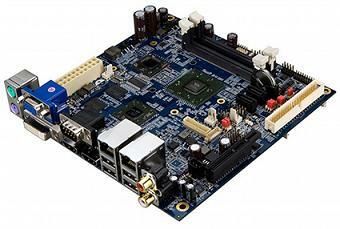 Named as VB8003, it is a Mini-ITX form factor platform featured with both integrated and discrete graphics solutions to expand the HDMI ports on top of existing VGA and DVI interfaces. The platform is embedded with a VIA Nano processor clocking at 1.6GHz. Further coupled with its combo northbridge/southbridge VX800 chipse and built-in Chrome9 2D/3D graphics core with external 4GB SODIMM memory, it offers an excellent two chips solution suitable for graphics intensive applications. Surprisingly, the fab-less manufacturer has taken extra step to include a DirectX10 compliant S3 Chrome 435 ULP which can support additional two video decode pipelines and eventually make the platform capable of delivering additional dedicated video outputs especially suitable for digital signage usage. The S3 Chrome 435 ULP is capable of delivering full HD (High Definition) video decode capability for various famous formats such as H.264, WMV-9, VC-1 MPEG-2/4 and many more. So in total, there are four video output ports, with both HDMI and VGA being driven by VX800 chipset and additional HDMI and DVI being delivered by S3 Chrome 435 ULP directly. Other hardware specifications include two Gigabit Ethernet ports, four USB 2.0 host ports, Type II CompactFlash slot, both SATA and IDE connectors, S/PDIF digital audio output as well as other legacy ports such as serial, PS/2 and many more. No availability information yet, the platform will cost around $340 and since it is a X86 based architecture, it will be compatible to run on Windows XP, XP Embedded on top of Linux Operating Systems suitable for Point of Sale, Digital Signage and any environment where multiple HD media displays is required.